I figure I would make a poor cinematic version of a Mexican-American for a variety of reasons. One: I'm not Catholic. Two: both my parents are citizens (one native-born, one naturalized before I was born). Three: I don't know any gang members (at least personally). I knew one that tried to pass for one, but he was the Captain of the Math Club, so his street cred was highly suspect. Four: I never lived in California. In short, I would look completely out of place in a film like A Better Life. I listen to bluegrass, not something usually covered by Los Tigres Del Norte. Therefore, A Better Life, despite my heritage, is a foreign subject to me. Not so for director Chris Weitz, who is one-quarter Mexican, and thus A Better Life must somehow resonate with his past, though if I'm allowed a touch of cynicism, I can't imagine how: I doubt he ever had to listen to La Puerta Negra at almost every wedding, quinceañera, birthday party, and bar mitzvah he attended, but I digress. In any case, A Better Life is a better film than most released this year, though far from perfect. 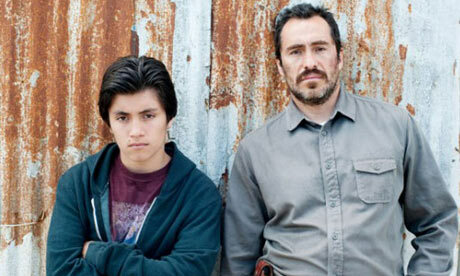 Carlos (Demian Bichir) is like every Mexican/Mexican-American in America: illegal. He is a humble gardener in East Los Angeles. Carlos does his best to stay out of trouble, otherwise he will deported. Therefore, he just goes to work and comes home exhausted. His boss/friend Blasco (Joaquin Cosio) offers to sell him his truck/business, but since Carlos doesn't have either the money or the papers, he keeps turning him down. Fortune, however, smiles his way when Carlos' sister Anita (Dolores Heredia) lends him the amount necessary to get the truck. Most if not all of this is thoroughly unimportant to Carlos' son Luis (Jose Julian). His time is spent ditching school, spending time with his best friend, the gangbanger-worshipping Facundo (Bobby Soto), and making it out with his girlfriend Ruthie (Chelsea Rendon), whom I think is the Queen of the Cholas. In any case, Luis is a sullen, ungrateful child, but Carlos loves him all the same. Things appear to start out well for Carlos, but then in a shameless rip-off...I mean, an homage to Vittorio De Sica's The Bicycle Thief, Carlos' truck is stolen (and on his first day too). Carlos can't go to the police, so he begins the search himself. This spurs Luis to join his father in the search, and while they find the bicycle thief, I mean, the truck thief, in a short period of time, there is still a divide between father and son. Even the actual finding of the truck and its recovery isn't enough to give us a happy ending. Once father and son get said truck back and appear to start afresh, what should happen? Now with Carlos on his way to a forced exile, Luis must now decide whether to submit to his strict aunt's rule or enter that beautiful world of tattoos and homeboys. The biggest problem I have with The Troca Thief...I mean, A Better Life, is this: that Eric Eason's screenplay (from a story by Roger Simon) tries for a Bicycle Thief-style story (right down to having the truck Carlos needs to work stolen so quickly after he buys it) without acknowledging it as inspiration. The second act in the film is the search for the truck but, given how Luis has been up to this moment, we don't know why he suddenly jumps in to help his father. We don't see Luis showing that he cares that much for him, so this sudden shift in his behavior seems a bit out of character. I could go on about how A Better Life plays into the idea of Mexicans/Mexican-Americans in film are seen (always poor, always illegal, always East L.A.). Suffice it to say that I hope A Better Life, along with Under the Same Moon, Goal! The Dream Begins, and From Prada to Nada will not inspire others to accept the images of Mexican-Americans as seen here to be the 'typical' Hispanic life. I will say that the positives with the story outweighed the stereotypes A Better Life dealt in large measure. Chief among them were Bichir's performance. There's a sequence in A Better Life where we see Carlos drive around with his truck, ending with him staring at it with rapt attention as it is being washed while the other men around him are ogling the scantly-clad women. His face registers hope and fear and joy all at once. When he speaks, he commands both warmth and authority. In short, Carlos as a character is extremely human: eager to move up in life but not willing to sell someone out for it. I digress to state that while Bichir's performance was excellent as the father who cares for the son that doesn't care much for him, there is a risk of making Carlos too noble, too pure. This is certainly the case for when he does find the troca thief. Granted, it's another sign of Bichir's great performance (a mixture of hurt and rage building up and being pushed down), but it is Luis who reacts with genuine anger. Carlos, despite having had his truck (and livelihood) stolen, doesn't appear to have any real resentment against him. In fact, he almost appears to understand the troca thief's motives. This, again, didn't ring wholly true for me: a character can be good, but rarely does Carlos appear to be much more than a sacrificing saint. Throughout the film Carlos was never filled with any sense of anger at his situation but accepted things somewhat too calmly, too nobly. I would have hoped Carlos would have had a bit more conflict within him, but there it is. Julian showed Luis to be someone who doesn't hate his father, but who doesn't truly care for him or for the sacrifices Carlos is making for him. To his credit, he does have his own moment near the end of A Better Life. Having escaped from his Aunt Anita, he goes back to his house. There, he hears a phone message from his father informing him that he is going to be deported and how he hopes Luis will see him one last time. As the truth of how his father did try to give him a better life, we hear Facundo at the door, calling for him. If he opens the door, more than likely he will be called on to be 'jumped in' to the gang. This decision, his first truly adult one, is his and his alone. Will Luis go for a better life himself? At its heart, A Better Life isn't all that much about illegal immigration. It is about fathers and sons, how one pushes the other away and understanding almost too late the sacrifices made to provide "a better life". It isn't one where they will live in a home featured on MTV's Cribs, but one where they can achieve something better than what they have and what current situations are offering. Those moments between Bichir and Julian are the best moments in A Better Life, where the son can see what the father has been trying to do for his son. In the end, I couldn't help think that in a curious way, A Better Life could be a sequel to Under the Same Moon. Little Carlitos in the latter could have grown to Carlos in the former. The film doesn't take a strict pro or anti-immigrant stance although there is a quick scene of an illegal immigrant rally while father and son search for the stolen vehicle. It wasn't overt about taking a stand in either direction and if it did, I missed it. 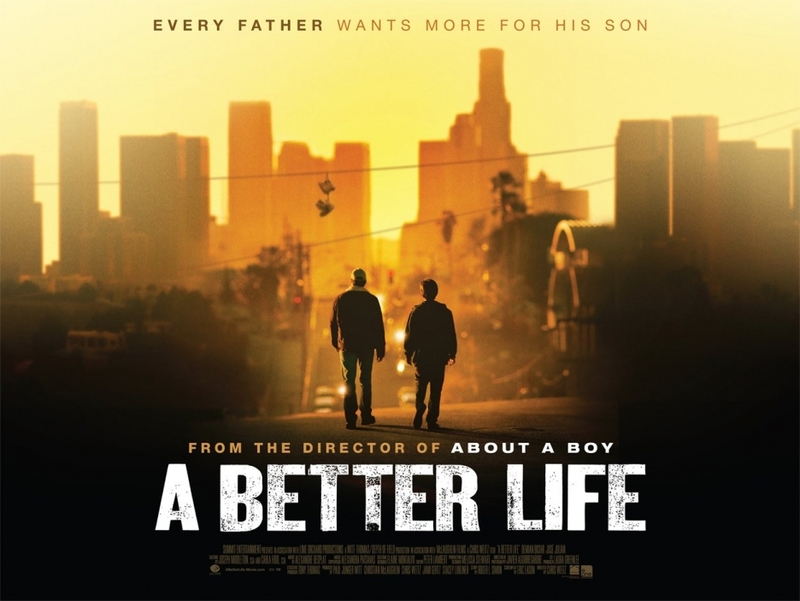 A Better Life has some wonderful moments of acting courtesy of Bichir and at its heart, the film is really a story of fathers and sons who are divided by more than a border between countries. It is about understanding that sacrifices must be made if one wants to rise to a higher and better position in life. By making it a human story, A Better Life makes a solid case that a father's love is stronger than any fence built by a government or a child.